It was a long day packed with chance meetings and, of course, countless delights. I'm a bit dismayed to discover that I took only a few photos during Preview Night - but there are days and days to come. (Note to self: Take more photos!) The goodie bag attendees received had a Comic-Con image on one side and a variety of Warner Bros. images on the other. Attendees took what they were given, but many followed up the action by trading for the most desired images. Daughter Valerie and I began with a bag featuring "Geoff Johns * Jim Lee Justice League Fall 2011" and a bag featuring a Warner Bros. vampire series. Another fan asked to trade the vampire bag for another "Justice League" bag, and I agreed. Eventually, still another fan asked if I'd be willing to trade one for a "Big Bang Theory" bag - and so it went for many collectors devoted to one pop-culture treat over another. 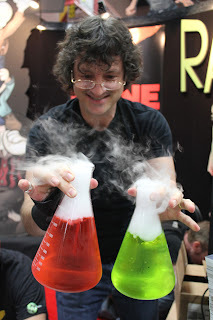 The Cartoon Books booth quickly developed a lengthy line as Jeff Smith chatted with fans whose purchases (anniversary hefty Bone collections, Bone T-shirts, other Bone items, and the three trade paperbacks of Rasl) he was signing. And, of course, that was only one of an overwhelming assembly of displays. There were toys, comics, movies, TV shows, and other collectibles (Valerie bought a delicious Little King figure, for example - and there was more, more, more.) 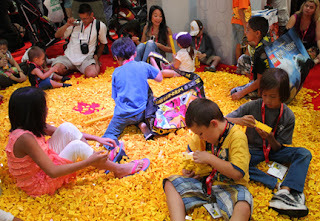 We checked out the Lego booth for possible treats for her son, Devon, and that booth was a delight to younger attendees. 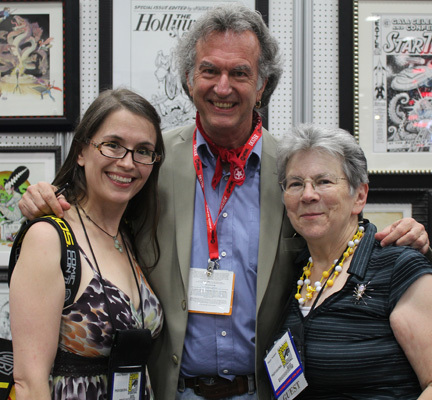 It's something of a blur, but the exhibit-room evening wrapped up with a delightful conversation with William Stout and Samantha Holmes (of Leapin' Lizard Entertainment) - and she was nice enough to provide photography services for a shot. (Thanks, Samantha!) It should be noted that she had just produced a film in which Stout had served as a serial killer (and she had played one of his victims). Looking forward to seeing it someday, I must confess. And, for that matter, to tomorrow - when I hope to post much, much more. This blog is fantastic, I hadn't seen any similar before. I have to accept I found it out by a lucky stroke, but I'm impacted with its quality. I hope you continue posting with the same passion you did it here.